In the heart of London is Benjamin Franklin House, above, the world’s only remaining Franklin home. For nearly sixteen years between 1757 and 1775, Dr Benjamin Franklin – scientist, diplomat, philosopher, inventor, Founding Father of the United States and more – lived behind its doors. Built circa 1730, it is today a dynamic museum and educational facility. While lodging at 36 Craven Street, Franklin’s main occupation was mediating unrest between Britain and America, but he also served as Deputy Postmaster for the Colonies; pursued his love of science (exploring bifocal spectacles, the energy-saving Franklin stove); explored health (inoculation, air baths, cures for the common cold); music (inventing the delightful glass armonica for which Mozart, Bach and Beethoven composed) and letters (articles, epitaphs, and his witty Craven Street Gazette), all while forging a hearty social life and close friendships with leading figures of the day. The House, built circa 1730, is architecturally significant. It holds a Grade I listing and retains a majority of original features (central staircase; lathing; 18th century paneling; stoves; windows; fittings; beams; brick, etc) ‘unimproved’ over time. Fast forward to 1998, when the first conservation work began at Craven Street. It was interrupted by the discovery of bones, both human and animal, under the floor of what is today the House’s Seminar Room (originally the garden in Franklin’s day). The London coroner was called and he determined that the bones were more than 100 years old so no inquest was needed. Display Label: This cabinet displays a selection of the bones found ten years ago in the basement of the house. They are the result of William Hewson’ anatomy school, which opened here at 35 Craven Street on the 30 September, 1772. They are being shown here for the first time since their discovery. Although this is only a small collection of the original number of bones found, the specimens selected for display are of particular medical interest. Consequently, the House team invited Dr. Simon Hillson and colleagues from London’s Institute of Archaeology at University College London to study the bones and their research has provided valuable historical details. In due course, Hewson opened his own anatomy school at Craven Street. The human remains derive from over 15 people and show dissection marks from surgical instruments (animal remains were found primarily in the front of the House in the old coal depositories). For example, a femur bone has been cut cleanly probably demonstrating the process of amputation. This was a valuable skill when there was little knowledge of sterilisation and much diplomacy took place on the battle field! The skull pieces have circles drilled out from a trepanning device – a sample of one is on display in the Seminar Room. Trepanning was primarily used to relieve pressure on the brain. However, relatively few surgical operations had any likelihood of success; invasive procedures were made difficult by the possibility of major blood loss and infection, and the lack of anaesthetic, not used until 1846. Anatomy was a hazardous area of study: during a dissection in 1774 Hewson contracted septicaemia and died aged just 34. As Franklin wrote to his wife Deborah: “Our Family here is in great Distress. Poor Mrs. Hewson has lost her Husband, and Mrs. Stevenson her Son-in-law. He died last Sunday Morning of a Fever which baffled the Skill of our best Physicians. He was an excellent young Man, ingenious, industrious, useful, and belov’d by all that knew him. She is left with two young Children, and a third soon expected. He was just established in a profitable growing Business, with the best Prospects of bringing up his young Family advantageously.” Polly would eventually move with her children to Philadelphia to be close to Franklin after the close of the Revolutionary War. Visit the Benjamin Franklin House website here. Read more about the history of Craven Street here. Though he was born in Boston in the colony of Massachusetts and lived much of his life in Philadelphia, Pennsylvania, Franklin’s only remaining intact residence is found at 36 Craven Street, London. We were astonished to find it almost in the shadow of the huge Charing Cross Station in a street of Georgian terraced houses. Although most of London looks very different in the 21st century, one comes upon these Georgian streets in several neighborhoods. We hope they are preserved forever. At the end of the block is a building which also housed a famous American. And around the corner, beyond the Pubs, is the tunnel into Charing Cross station. The Benjamin Franklin House website is here. Many artifacts are shown, particularly Franklin’s glasses (he invented bifocals for reading), printer;’s tools, and medical equipment. The tour through the house takes visitors from room to room, with explanations of the architecture, furnishings of the rooms, and visuals projected on the walls. Not only does one learn about Franklin and his life and times, but the bones of the house itself are revealed in all their elegant Georgian simplicity. Upstairs, is n example of a musical instrument Franklin invented, the glass armonica (or harmonica), for which Mozart and Bach composed, among others. It plays beautifully with a ringing clarity and has been used over the centuries in various orchestral works. 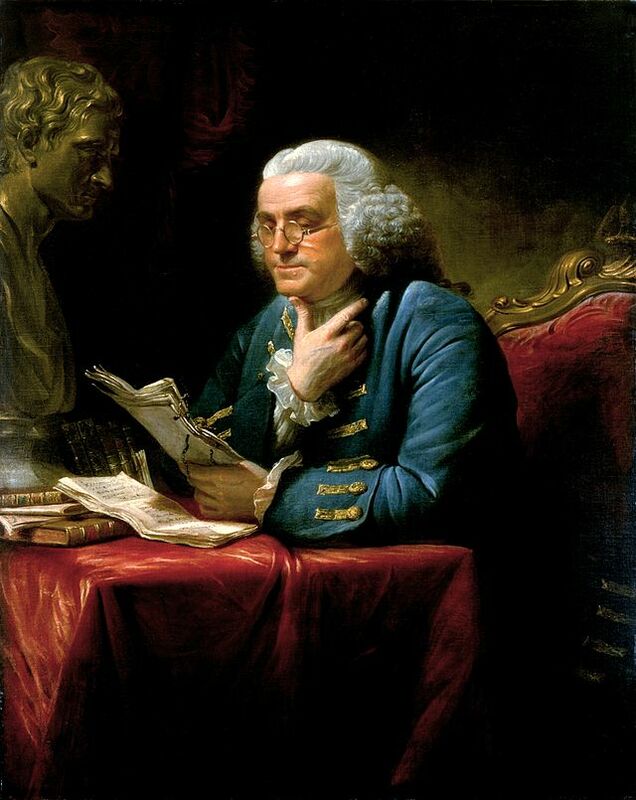 The accounts of Ben Franklin’s life in London, his relationship with his landlady’s family, and his position in society are well covered, even for American visitors who are more familiar with his life than most British school children. Or at least one would hope so! The program is creative and imaginative. How anyone cannot come away with many more questions about this fascinating man was beyond our ken! Well worth a visit when you are next in London. More about Franklin to come. While we were in Windsor after the tour Kristine, of course, came down with the usual malady she suffers through on each of her trips over. Thank goodness it waited to arrive until after the Tour was finished. While she lay dying in bed at the hotel, I trotted off to see a few Windsor sights I had missed on previous visits. Nothing like a good friend in need, I thought. But to tell the truth she was in no mood to be either entertained or conversed with. The best thing I could do was let her sleep!! One place I was eager to see was the special area in the Windsor and Eton Railroad Station that had been reserved for the use of Queen Victoria and her attendants back in the day. I had long heard it was in the station, but where? That station has been turned into shopping mall — which we had visited to enthuse over the Jo Malone shop — a favorite of both of us for special luxurious and fragrant cosmetics, Never saw the Queen’s loo. But when I enquired at the station, I was pointed in the direction of All Bar One restaurant at the far end. And indeed, it was entirely open to the public, if you knew it was there. The writing on the door says ‘This room is reserved’ — but the proprietors are perfectly willing to allow one inside. It was fitted out as a special private dining room — not the actual loo of course, but the associated small waiting rooms used by the Royal party. The basin and loo were actually glassed off, either to protect them or to continue the exclusivity…if Queen Elizabeth II happened by, would they allow her to use the facility??? Just outside All Bar One, was a non-working locomotive. It seems that the locomotive is about all that is left from displays formerly set up on the station by Madame Tussaud’s wax museum, no longer in operation in Windsor. The text panel reads: The locomotive is a full scale replica of the GWR Achilles class 4-2-2 locomotive No. 3041. It was built in 1804 and originally named “Emlyn” after Lord Emlyn, Chairman of the Great Western Railway Company. Repainted in 1897, in GWR livery, the great locomotive, 57 feet long was renamed “The Queen” especially to pull the six new carriages of the Royal Train. No examples of these locomotives survive today and “The Queen” (later renamed “James Mason”) was withdrawn from service in 1912. Next time you are in Windsor, check it out! Not as stunning as the Castle, but an amusing sidelight on the Queen who was the first Royal to use the railroads for her travel. 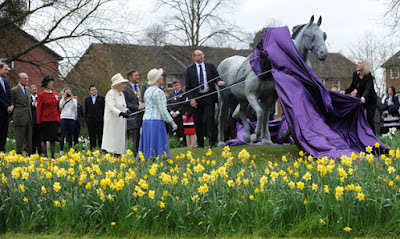 Both Victoria and I were looking forward to seeing to seeing the Windsor Greys when we were there last. 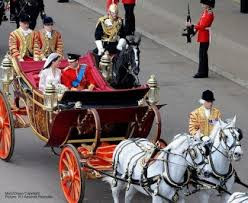 The term Windsor Grey is given to grey horses used by the Royalty of the United Kingdom to draw carriages and coaches in various ceremonial processions and, since 1986, when The Queen is Trooping the Colour. They are stabled in the Royal Mews. Some have also represented the crown in various carriage combined driving competitions, at times driven by Prince Phillip, the Duke of Edinburgh. Two Windsor Grey horses, Claudia and Storm, at the Royal Mews in London are available for observation daily. Storm was featured in a statue with another of the type, David. Back in 2012, we ran a post on the drive to raise money to fund the Windsor Greys Jubilee Appeal which was the committe charged with delivering a statue of the horses in time for the Queen’s Diamond Jubilee. Really, these horses couldn’t be a more fitting symbol to honour Her Majesty, who has such an affinity for horses, and because of their link to Royal traditions. 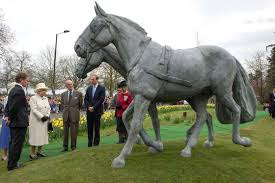 Thankfully, and not surprisingly, the money was raised and sculptor Robert Rattray executed the statue in bronze, which took over a year to complete, and was on hand when Her Majesty unveiled the life sized piece in March of 2014. The statue stands in the middle of the Kings Road/Osborne Road roundabout, ready to greet visitors. As stated above, you can see the Greys at the Royal Mews in London. 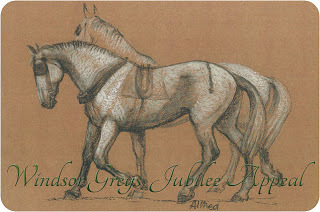 Below is a display showing how the Greys look when pulling the Royal carriages. Above and below, Stevenson, one of the horses who are regularly used on the Royal carriages in his stall at the Royal Mews. Victoria snapped these photos while we were there for the Duke of Wellington Tour.